LACK of reading materials in schools has resulted in poor reading culture, Zambia National Union of Teachers secretary general Newman Bubala has observed. Mr Bubala said the lower reading levels in the country were due to lack of material in primary schools across the country. He said teachers were finding difficulties on how to monitor children’s performance in schools because readers were few in most cases. But Mr. Bubala said some teachers also never spend much time on children when it comes to teaching pupils how to read, adding that the poor reading culture in Zambia was alarming. He said it was the duty of teachers to support and implement Government policies on the revised school curriculum, and not to be spending time discussing politics. And Mr Bubala also called on parents to supplement Government’s efforts by encouraging the reading culture in the country. ‘‘It is high time that parents invested in the education of their children by buying necessary reading materials for their children because Government alone cannot meet the demand of reading materials,’’ he said. Mr. Bubala bemoaned the lack of infrastructure and shortage of staff in most schools at primary level. He said the pupil-teacher ratio had also worsened the problem as teachers were now attending to more pupils than the required number. He explained that for primary schools, the teacher-pupil ratio stood at 1-40 while for secondary schools at 1-35, but most schools are yet to meet the required standards. 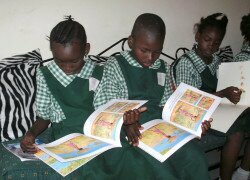 In 2014, Government launched the “Let’s Read Zambia” mobilization campaign aimed at encouraging parents to take passionate interest in the education of their children as this will help parents to understand the challenges Government schools were faced with in providing quality education. Mr. Bubala called on the private sector and the general public to partner with Government in supporting the development of a reading culture among Zambians.